Be the first to share your favorite memory, photo or story of Lyndon. This memorial page is dedicated for family, friends and future generations to celebrate the life of their loved one. Fairfield – Lyndon E. Corey a longtime resident, dairy farmer, sugar maker and fire chief passed away Tuesday, March 26, 2019, at the Northwestern Medical Center with his family at his side. Born in Fairfax on June 5, 1932, he was the son of the late Percy L. and Ethel (McGowan) Corey. Lyndon was 86 years old. On December 8, 1956, in Sheldon, Lyndon married Joyce Reed, who survives him. Lyndon served his country in the U.S. Army and came back home and operated the family dairy farm along with their sugaring operation. He was very active in Fairfield, a community he loved. 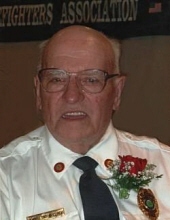 He was a founding member of the Fairfield Volunteer Fire Department, where he served 50 years as fire chief, 40 years as fire warden and Justice of the Peace. He was longtime member of the Franklin County International Firefighters Association, and in 2013, he received the Fire Chief of the Year Award from the Vermont State Firefighters Association. He also was a founding member of the Franklin County Field Days and served as Superintendent of the draft horse pulling competition at the Champlain Valley Fair. Survivors include his wife of 62 years, Joyce, of Fairfield; their sons, Tim Corey and Martha Manning of Fairfield, Jeff and Linda Corey of Fairfax and Gary and Danielle Corey of Fairfield, as well as his grandchildren, Amanda Corey and her significant other, Justin Lussier, Emily and Charles Bailey, Faith Corey, Griffin Corey, Morgan Manning, Sarah Rainville, Nicholas Manning, William Manning, Oliver Manning, and great-grandchildren, Kadence Bailey, Korbyn Lussier, Evie Lussier and Brayden Manning. Lyndon is also survived by his brother, Everett Corey and sisters, Ruth Jerger, Cecile Hutchins and Iona Reed and her husband, Robert, and many nieces and nephews. In addition to his parents, Lyndon was predeceased by his brother, Merton and sister, Ruby Minor and her husband, Thomas; niece, Marie Minor and brothers-in-law, Alfred Jerger and Clyde Hutchins. Relatives and friends are invited to attend calling hours on Monday, April 1, 2019, from 4:00 to 7:00 PM at the Heald Funeral Home, 87 South Main Street, St. Albans. A funeral service will be held on Tuesday, April 2nd at 11:00 AM at the Lyndon E. Corey Firehouse, 4964 Route 36, Fairfield with Pastor SangChurl Bae officiating. Prayers of committal and military honors will be at a later date in the Sheldon Village Cemetery. Those planning an expression of sympathy are asked to consider the Fairfield Volunteer Fire Department, 86 Sam Webb Road, Fairfax, Vermont 05454. To send the Corey family a message of condolence or share a memory, kindly go to his online guestbook at www.healdfuneralhome.com. To plant a tree in memory of Lyndon E. Corey, please visit our Tribute Store. "Email Address" would like to share the life celebration of Lyndon E. Corey. Click on the "link" to go to share a favorite memory or leave a condolence message for the family.